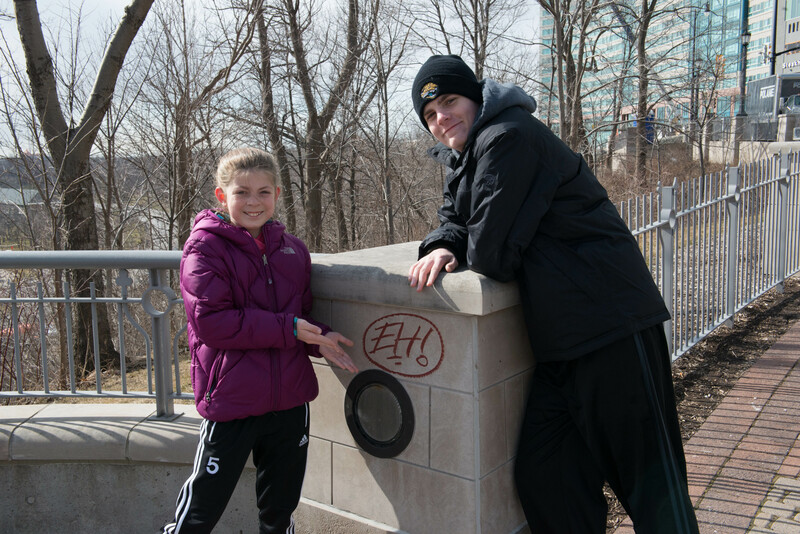 We spent our Spring Break in Niagara Falls, Canada . . . basking in the gaudiness of nature. And generally freezing our collective tookus off. It’s a good thing I packed my touque! Even half-frozen, the falls were as majestic and beautiful as the brochure promised. And surrounded by all that icy nature, one thing stood out: Canadians really do say Eh. A lot. It’s kind of fantastic. Look . . . Canadian graffiti. Truth be told, I had an ulterior motive for our trip to the Great White North — a pilgrimage to Icewine Mecca. While researching my blog post about Icewine (N’Ice Wine), it hit me that visiting Niagara Falls would be the perfect rouse to explore some Icewine wineries. Mission accomplished! 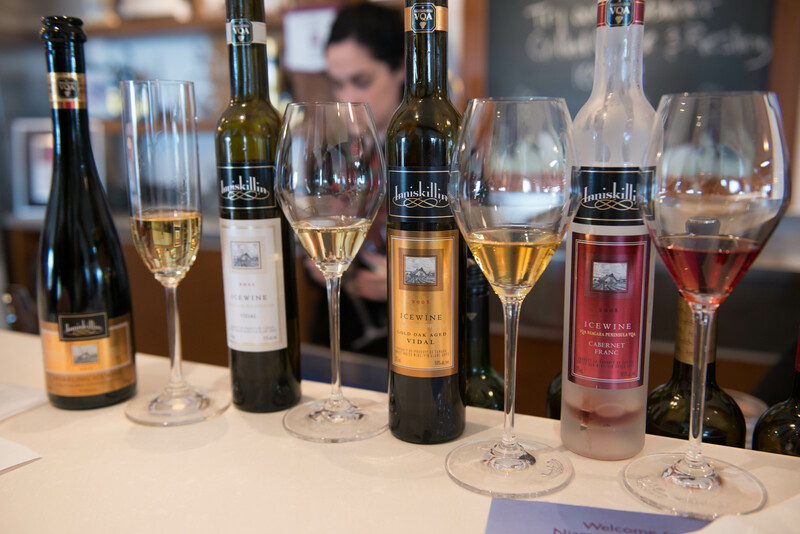 We visited two wineries while we were in Niagara — Inniskillin and Reif Estate. The biggest difference I noticed between Canadian wineries and US wineries is in how they price their tastings. In the US, you pay a flat fee (anywhere from free to highway robbery) to taste a set number of wines. And the tasting fees are refunded with purchase . . . sometimes. In both the Canadian wineries we visited, they charged $1 per taste. The fee is higher for Icewine tastings ($5-7 per taste). You can taste as many wines as you want, but go easy, Eh? Canadians are generous pourers. In the US, you might get a two ounce taste. In Canada, we were tasting 4 ounces. In both wineries, our tasting fees were refunded, but only after we’d spent $100. You have to pay to play . . . 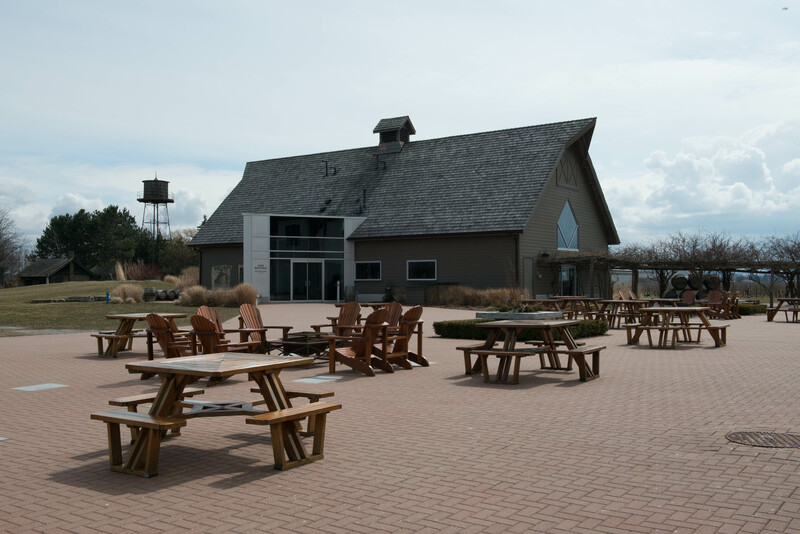 The perk to visiting Canadadian wineries in March — no competition for outdoor seating. A Little History: Inniskillin was the first winery licensed in Ontario. Named after an Irish military regiment of the British Army (the Royal Inniskilling Fusiliers), Inniskillin sits on land once owned by a member of that regiment. 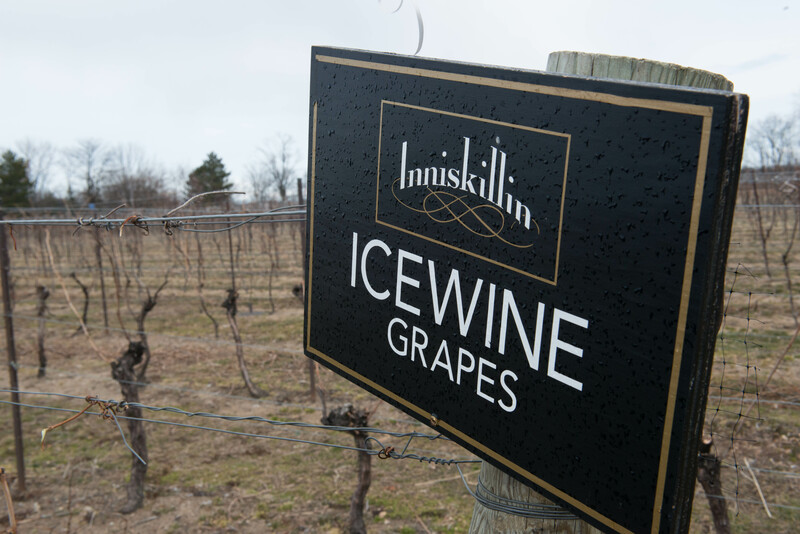 Inniskillin’s first grapes were planted in 1974, and their first Icewine (a Vidal) was produced in 1984. 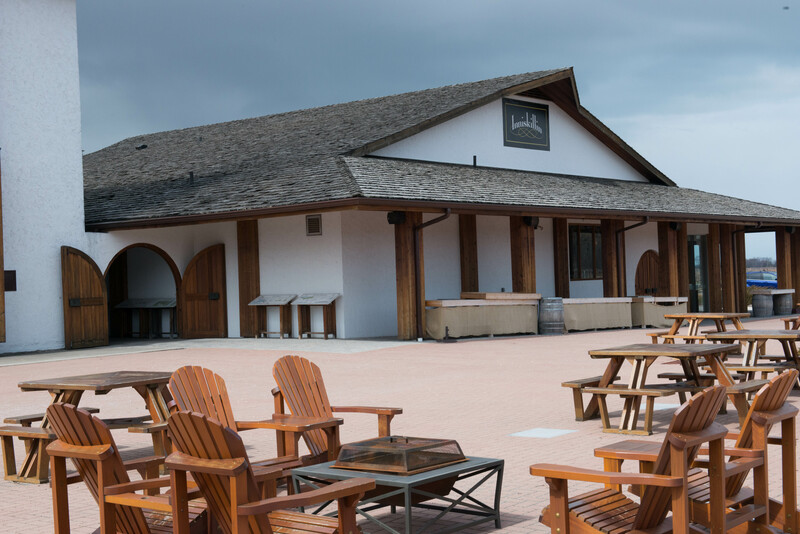 Our tasting room hostess told us Inniskillin has 30 acres of grapes on the property, but sources grapes from over 300 acres in surrounding areas. The Inniskillin tasting room is in the Brae Burn Barn (Brae Burn is Gaelic for ‘hill stream’). Nevermind that the nearest “hill” is in Pennsylvania. Rumor has it Frank Lloyd Wright designed the barn. Meh. Frank Lloyd Wright designed every third building in the Northern Hemisphere. Let’s talk about the wine . . .
We tasted two white wines at Inniskillin. Please Note: All prices listed are winery prices, in Canadian Dollars. Aged in both French and American oak, and then transferred to stainless steel. Medium body. I’m really starting to like cool-climate Chardonnay. Loads of pear on the nose. And wait — is that popcorn I smell? Fun! Flavors are green apple, followed by a finish of butter, vanilla, and toast. $18. Sold. Tell-tale petrol notes on the nose, but you really have to stick your nose into the glass to find them. The flavors are difficult to pull out, as well — peach and wet stone? But only because I feel obligated to taste peach and wet stone. It’s a very light-weight, almost weak wine. $18. Pass. We passed on tasting any of the Reds . . . because what we’re really here for is the Icewines! The Icewine tasting flight was $25 for your choice of 4 Icewines. Your tasting is serious when they break out the Riedel glasses. Made using the Charmat, or Italian method (where secondary fermentation takes place in stainless steel tanks, rather than in individual bottles). Dripping with flavors of apricot and honey. Shazam! This is yummy. The bubbles cut the sweetness of the wine, lending to a clean, lingering finish. $80 for the 375ml bottle. Psst . . . you can get it for $60 on the Interweb. This was my favorite of the flight. Extremely well-balanced . . . I don’t get that “too sweet” headache between my eyeballs when I drink this. If you had the patience to harvest a gazillion honeysuckle flowers (give or take a flower) for their nectar, this is what you’d end up with. Yum! $50 for the 375ml bottle. Ooof! This is sweet. Approaching too sweet. Compared to the regular Vidal Icewine, the oak aging is apparent — layers of vanilla and coconut. This Icewine reminds me of baklava. I love baklava. But only one piece. Any more than that is just . . . ooof! $90 for the 375ml bottle. The ruby hue comes from pressing only — there’s no skin contact during fermentation. And it’s so pretty in the glass — kinda reminds me of hummingbird nectar. A hint of rose petals on the nose. Flavors are strawberry and vanilla. $100 for the 375ml bottle. 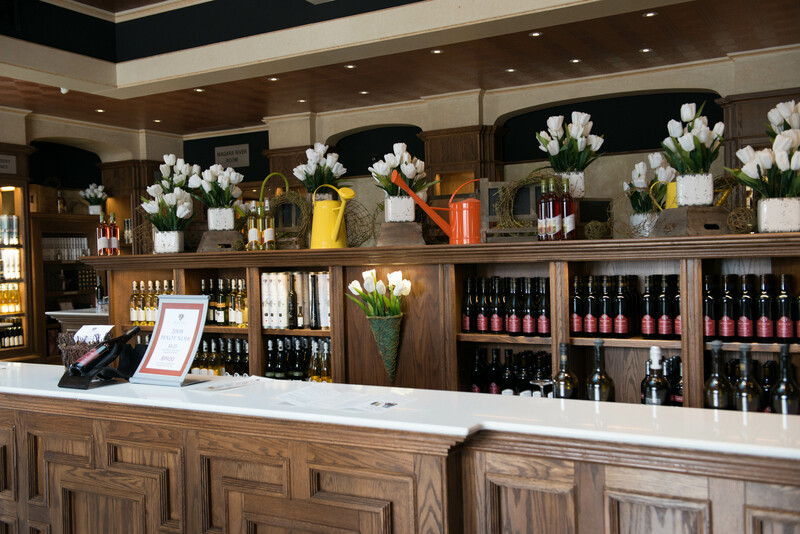 Tip of the Day: Always ask the winery tasting room staff for restaurant recommendations. Wine people are almost always food people . . . they know the best local places to eat. Thanks, Jessica, for sending us to The Old Winery Restaurant in Niagara-on-the-Lake. Authentic Italian pizzas from a wood-burning oven. Behold . 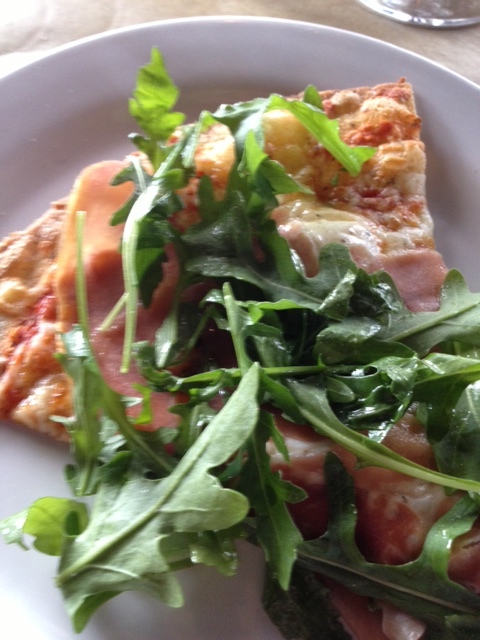 . . pizza with prosciutto and arugula! Stopping at Reif was an impulse. We drove by and noticed a German flag flying next to the Canadian flag in the courtyard. Our people are German, so we stopped. Glad we did . 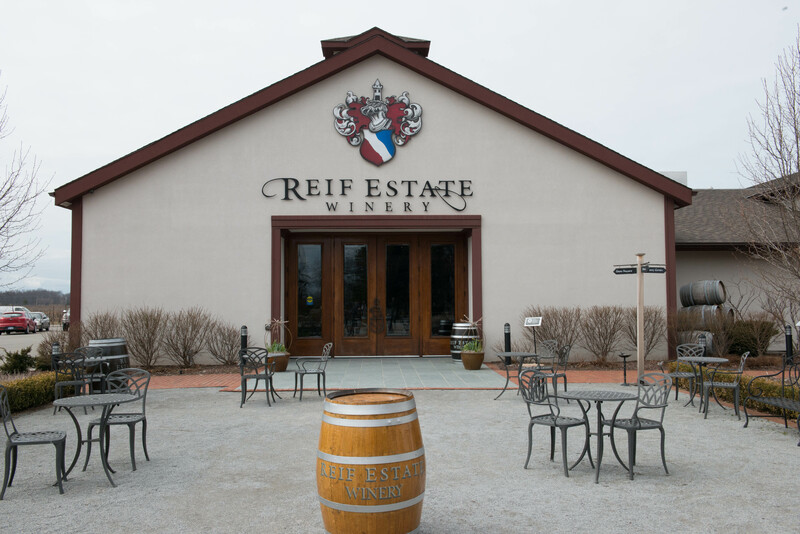 . . now we know the Reif Family has winemaking roots that date back to the 17th century in the Rhine River town of Neustadt, Germany. Reif has an enormous list of wines to taste — 33 in total. You couldn’t taste them all in a day. Well, you could, but you’d probably get to meet the Canadian Mounties and/or take a tour of a Canadian Emergency Room. Check out Reif’s gorgeous tasting bar. The tulips make you feel like it’s spring . . . even though you’re wearing mukluks and a touque. A barely-there straw color in the glass. Super lightweight. Delicate, with faint aromas of peach and petrol. Citrus flavors with a gripping acidity. For $12, it’s coming across the border with me. Not sure I’ve ever had a Gewürztraminer-Riesling blend before. Typical perfume notes on the nose. Light body with a touch of sweetness. Peach, lychee and honey flavors blend nicely in the glass. I’m anxious to try this with Thai food back at the ranch. $15. Sold. A Pinot Noir-Shiraz blend? Huh? I mean, Eh? I was curious. And I should have stayed curious. Because once you taste this wine you can’t untaste it. Seriously. It’s not good. The tasting bar host was so excited about this wine — and I hate it when I don’t share the love. I had to dump it. $30. $30?!? Egad. BIG pass. Beautifully balanced with gripping acidity. The nose is raw honey. Flavors are apple pie, apricots and maybe a smidge of nutmeg. The finish goes on and on. Gorgeous wine. $47 for the 375ml bottle, or $25 for the 200ml bottle. 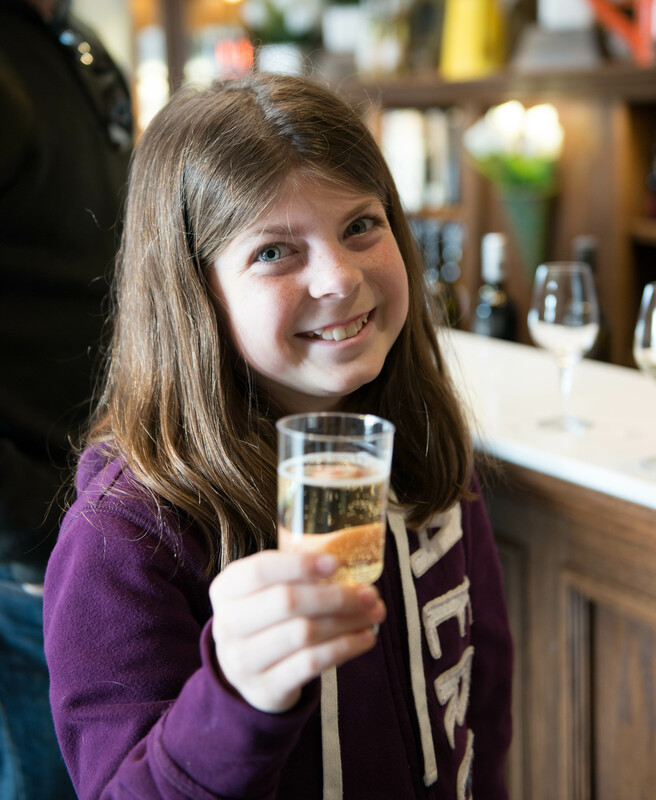 Take a memo, America: Canadian wineries serve kids sparkling white grape juice in fancy stemmed glasses. This buys parents an extra 30 minutes of whine-free winery time. Now here’s a bit of marketing genius. 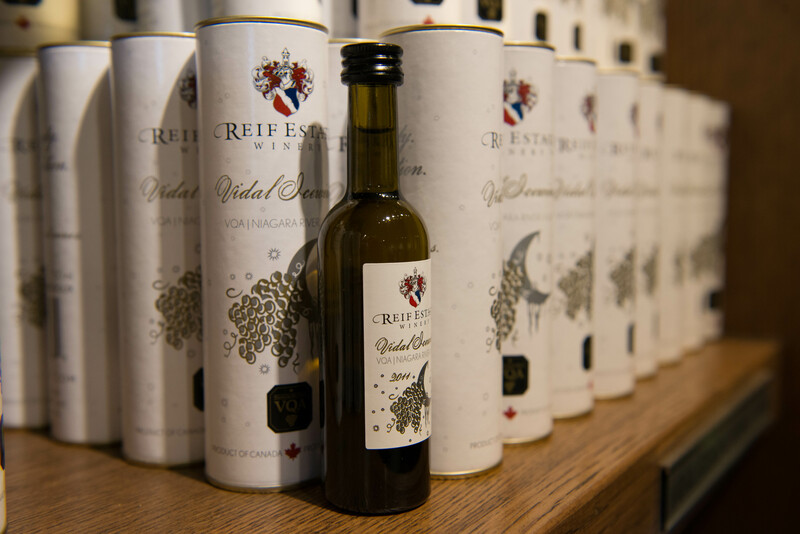 You can buy Vidal Icewine in adorable little 50ml bottles for $8. Hello, stocking-stuffers! Bonus (according to my Marine Artillery husband): they come in mini-mortar tubes! If you have the opportunity to visit some of the Niagara wineries . . . do it! You might consider waiting until it’s actually spring before you go, though. Everywhere we went, we heard the same Canadian refrain, “You should come back in the spring, eh?” Twist my arm . . . but only if I don’t have to drive through Pennsylvania to get there! Excellent write-up! I like the slam on PA, but taking a shot at FLW? Don’t get me wrong. I like FLW. We visited Falling Water – stunning. But the man was so prolific — sometimes I think every structure on the planet is rumored to have been touched by FLW. We visited Inniskillin and few other wineries about 2 years ago, and tasted lots of great wines. I actually liked the reds at Inniskillin – brought home couple of bottles of Cabernet Franc, it was quite good. Nice reviews but I really don’t understand why wineries in North America charge tasting fees – that’s just dumb. How should people get to know they charge excessive tasting fees. In theory, I get why they do it . . . too many limos full of bridesmaids (and the like) looking for an open bar. But I think the fees should be reasonable and refunded with a purchase. Well in Europe (at least in Italy and Germany and as far as I know in France, too) wineries tend not to charge tasting fees – at least I never had to pay one. I mean if someone takes the effort to actually visit the winery then they should not pay for the wine. If I like the wine I tried during a tasting then I’m willing to buy a bottle or more but if I didn’t like it then I won’t. It’s true. In Europe you don’t pay to visit a winery and have a tasting – just make sure that you let them know you’re coming along in advance! Then once you’re there you are slightly co-coerced into buying a bottle or two, but you can always say no! How lucky you are to taste so much Icewine! It’s a real rarity in the UK – you’re luck to find a single bottle never-mind four! Eeek! No Icewine in the UK? What about your Euro neighbor — German Eiswein? Is that more readily available? Salud & thanks for stopping by, Julia!! Don’t get me wrong you can find it – but it isn’t an easy mission!! German and Austrian Eiswine is available too, but because they may not have harvest every year like in Canada it is very expensive if you can get your hands on it! Icewine is painfully expensive, isn’t it? But SO worth it . . . mmmmm.